Are you looking for: DJI & Phantom. When you want more than 4 wheels on the ground, our Radio Control Helicopters and Drones will take you to the skies and back. 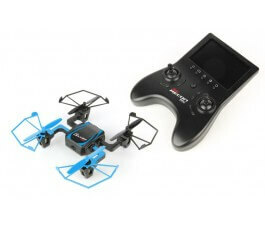 Our online toy store has Radio Control Drones and Quad Copters for every level of hobbyist. We offer the Ominus Vista Quad copters all the way up to Yuneeec and DJI professional Quadcopters. When you visit our online store, you can browse an awesome assortment; however, if you can't find what you want, we have more models in our toy stores. Shop today for Mr Toys discount pricing on Radio Control Drones, Quadcopters and Helicopters for your flying fun. Which Radio Control Helicopter is Right for You? The world of RC vehicles is huge. There are many to choose from that hit many different price points. Some are more for collectors while others you build yourself as a hobbyist. So how do you choose the right radio control helicopter for you? First off, consider the power source. Some are electric while others are gas powered. Gas powered helicopters may be a little more challenging as they may require mixing gas with oil and that can get messy. Others just need a battery or a hobby fuel. Radio control helicopters come in a wide range of channels. People can get anything from two to six channels. For those that are just starting out, it is likely that they are not familiar with what channels are appropriate. As a rule of thumb, two and three channel helicopters are often designed for children. If you are looking for a child’s gift, this is a great option. Four channel helicopters are great for beginners that want to really get into flying. They often come ready with a simulation to help you learn how to fly the helicopter, but you are limited with directions. These helicopters are ready with standard movements like forward and backward but are not ready for stunts just yet. The six channel helicopter is the beast for serious enthusiasts. This radio control helicopter is able to take flight into the 3D realm. Not only does it have standard forward, backward, side to side movements, but it also has inverted movements as well. This helicopter is one for the experts.